← The Slatebreakers take on AATE! 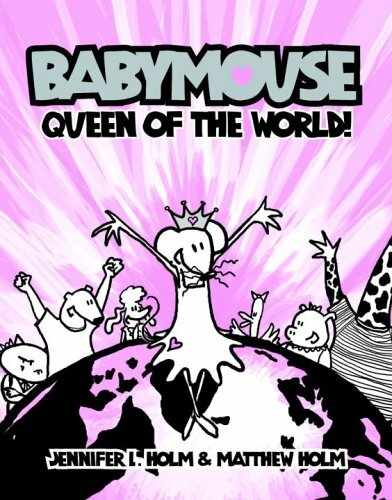 Babymouse: Queen of the World! by Jennifer L. Holm & Matthew Holm. Random House, 2005. Currently available. Face Value: This cover is vastly different from the typical primary colored, muscle man covers that you usually find in the graphic novel section. Babymouse is pink and proud. (She even has jazz hands.) With all that pink plus a crown and a few well-placed hearts, this cover screams, “Come and get me, girl readers!” Although I’m not really a girly-girl, I find this cover very appealing, especially since Babymouse is front and center. Does it break the slate? Not really. Although Babymouse is a funny and charming girl character, she doesn’t break the slate in this first book of the series. She challenges the social hierarchy of her school, but she doesn’t shatter gender stereotypes. Yet. In her fantasies, Babymouse imagines that she does some slatebreaking things, but she doesn’t enact these fantasies in her real life. 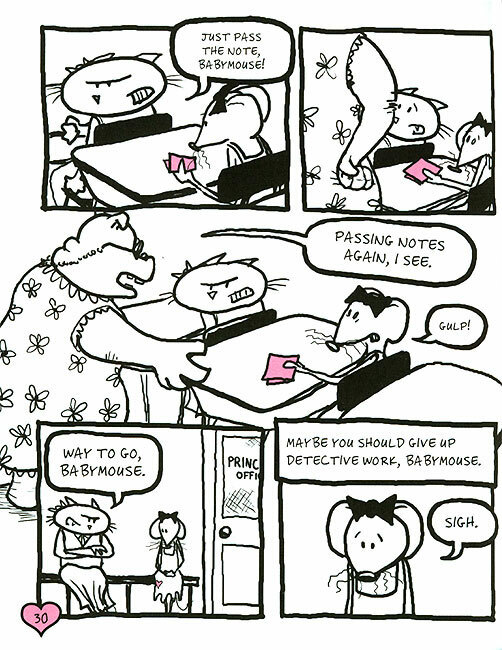 I plan to continue reading the Babymouse series because I think that she has major slatebreaking potential. Review: Babymouse is a mouse with an attitude. She’s kind of grumpy because she doesn’t like her tedious daily routine, especially because it involves going to school, which Babymouse thinks is sooooo boring. She would much rather read. Her life would be so much better if she were part of the popular crowd and hung out with queen bee Felicia Furrypants. Babymouse’s savvy attitude is reflected in the visual presentation of the story. The pink and black aesthetic, along with the energetically rendered animal characters, immediately drew me in. The visual experience begins at the front cover, which folds out to reveal Babymouse in the shower, crying, “Hey! I’m not ready yet!” This interplay between Babymouse and the unseen narrator of the book continues until the back cover and adds a meta-layer of hilarity to the reading experience. I especially appreciate how the dialogue between characters is in thought bubbles and the narrator’s commentary is in a text box in the frame. I’m not a frequent graphic novel reader, so I occasionally run into trouble trying to follow the story because I’m not very familiar with the conventions of graphic novel layout. Babymouse‘s layout is clear and easy to follow. For a visual example, here’s an excerpt from the book in which the narrator gives Babymouse some deadpan advice after a mishap in school: Babymouse is a sassy kid, but not in the typical “I’m a total diva!” way in which we so often see girl characters portrayed. Babymouse has a bad attitude because she doesn’t feel that there is a place for her in the world. She has her best friend, Wilson, but other than that there isn’t much social interaction that Babymouse can look forward to. She escapes into her books and her imagination because she doesn’t find satisfaction in her everyday life. Babymouse’s escapist fantasies are the highlight of this book. She is a major reader and reads all sorts of genres. (I love a girl character who loves to read! It is so empowering and so unfortunately rare.) As she daydreams, Babymouse escapes into her imagination and enacts the stories from her books. This is where we see the confident, empowered side of Babymouse – she steps into the leading roles of her fantasies, even if they are not typically female roles. She plays Wild Babymouse (Wild Bill Hickock), a private investigator, the captain of a spaceship, and more. In all of these scenarios Babymouse knows exactly what to say and comes out on top. If only she could have that confidence in her real life! Eventually Babymouse gets to peek into the popular girl lifestyle, and she realizes that it’s actually really boring. Sleepovers with Felicia Furrypants and her friends are not as exciting as she imagined – all they do is sit around, gossip, and paint their nails. Babymouse tells off the popular girls and realizes that she actually has a pretty great life with her loving family and her loyal best friend. It’s a small revelation, but it’s a nice one. Although Babymouse is just being introduced as a character in this book, she has the style and the finesse to really bust out in future stories and break some slates. I can’t wait to see what she does next! This entry was posted in Graphic Novels, Reviews and tagged Babymouse, Comics, Graphic Novels, Jennifer L. Holm, Matthew Holm, Middle Grade. Bookmark the permalink.